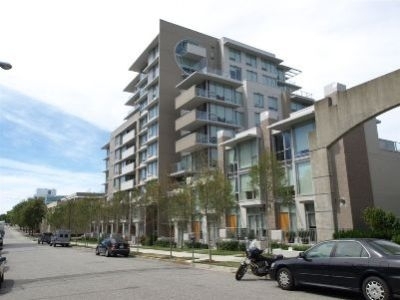 Welcome to City View Terrace, a gorgeous condominium with stunning city, mountain and ocean views, located in the coveted South Granville neighbourhood. This two-bedroom condo, designed by Ramsey Worden architects, is both elegant and inviting. Step across walnut hardwood floors and into an open area kitchen and living room where you will be greeted by views of English Bay, the North Shore Mountains and Vancouver's urban skyline. The kitchen is appointed with teak cabinets, polished-chrome fixtures, gas range, Bosch convection oven, Bosch dishwasher, microwave, and Sub-Zero stainless steel refrigerator. The two sumptuous bathrooms feature in-floor radiant heating, a soaker tub and a shower with both rain shower and regular shower heads. The living room, with a natural gas fireplace in a teak and glass surround, opens onto a balcony with a barbeque the best spot to watch the sunset. The unit also features a flat-screen television, audio system, DVD player, washer, dryer, and an office set up with a computer with high-speed internet. An exercise studio on the ground floor includes a steam room. You also have access to a ground floor party room with billiards table, wet bar, fireplace and access to the garden. On the South Granville Rise, you will be steps away from some of Vancouver's most charming neighbourhoods, shops and beaches. Two blocks east is sophisticated Granville Street, where you can window shop for First Nations masks, take in the latest show at the Baux-xi, or eat out at Vij's, the Cactus Club, Cru or West, all award-winning restaurants. Five minutes north by foot and you are at Granville Market. Here you can shop for fresh salmon and Fraser Valley vegetables, or spend a morning browsing the artisan stores tucked along side streets. From here you can rent a kayak or motorboat, for a toodle around English Bay, or take a two-minute ferry ride across False Creek to explore trendy Yaletown or to stroll, cycle or rollerblade the seawall leading to Stanley Park. West from the apartment you come to Vancouver's famous Kitsilano beach, one of Vancouver's prime spots to swim, suntan, picnic, or just read a book while keeping an eye out for seals popping their heads above the waves. At Kits Point you can visit the Maritime Museum, the Planetarium or take in the Bard on the Beach, Vancouver's famous out-of-doors Shakespeare festival. South of Kits Beach is trendy Fourth Avenue -- a street famous for its hippy past which now features some of the best clothes, shoes, and food shopping in the city. Easy access to public transit makes it pleasant and easy to head farther afield west to Pacific Spirit Park, or east for a day in Little India or the Commercial Drive area. From this charming condo you can launch yourself in minutes into the best Vancouver has to offer natural and urban -- while knowing that you will return at the end of each day to a gorgeous, welcoming refuge. Occupancy must not exceed the posted number of people the location sleeps. The information provided, though deemed accurate, is not guaranteed, it is subject to errors, omissions, change of price, or withdrawal without notice. Posted rates do not include sales taxes or cleaning fees where applicable. We are not required to collect sales taxes or cleaning fees on some of the properties. Some properties are subject to the Hotel Room Tax (HRT) at 2% depending on location as well as the Harmonized Sales Tax (HST) at 12%. Please ask your sales agent for more information and a complete property rental rate confirmation. First payment is a deposit of 50% of the rent plus applicable taxes due at time of booking. The balance is due 45 days prior to occupancy. Damage deposits are pre-authorized and are charged only if deemed necessary.